Tactical, practical, and completely attachable, the AR-15 is a gun modder’s dream. There is no situation an AR-15 can’t be made to fit. Sometimes those situations require a little extra illumination. This article will look at some of the best tactical lights and mountable flashlights for your AR-15. Why Would I Need a Light for My AR-15? 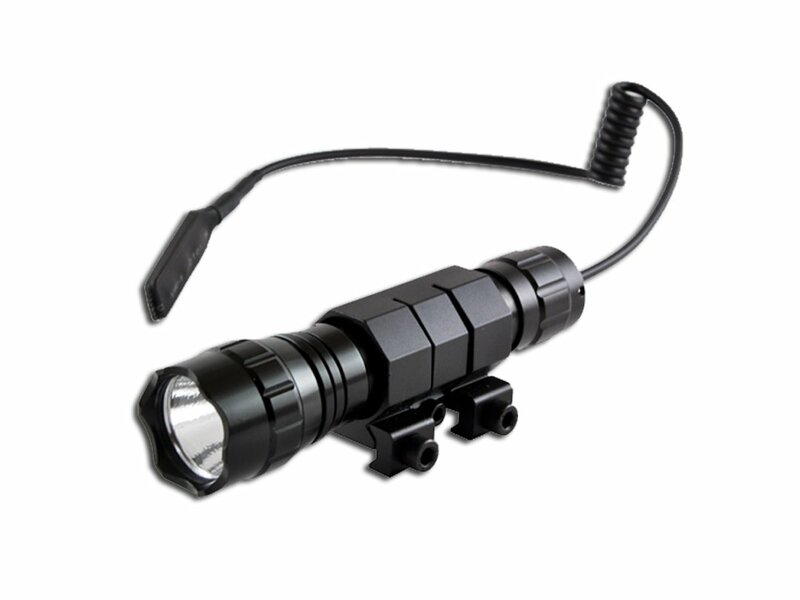 Tactical flashlights are useful because they provide light without requiring an extra hand. This means you have a more controlled, safer grip on your weapon, and, if necessary, a free hand. Whether it’s early morning, late night or even mid-day having a flashlight can serve many purposes. During the daytime, flashlights are useful for identifying animal tracks or for getting a closer look in darkened places. At night, flashlights are essential for IDing a target before taking your shot. The main need for a flashlight comes from identifying targets in low-light situations. This is especially important for home defense. A dark house makes it hard to discern between an intruder and a guest. By having the flashlight mounted to the handguard, you leave a hand open for better aim or for self-defense. A good tactical flashlight should have a few qualities: battery life, brightness, low weight, and durability (especially under recoil). And of course, it should be simple to use – no one wants a high-end mounted flashlight that is difficult to turn on and off under pressure. Brightness is the most hotly debated topic when it comes to mounted tactical lights. There are as many schools of thought as there are tactical flashlights. Generally flashlights can range from as few as 80 lumens to more than 1,000. So how is one supposed to know what to get? For indoor uses, I fall into the camp that says around 150 lumens is more than enough. This can illuminate small spaces without risking night blindness. But for outdoor lighting, it’s less clear-cut. I tend to feel that high-lumen flashlights have their uses, but ultimately can interfere with proper night vision. To complicate things further, many tactical lights come with different modes, like “moonlight mode.” These adapt your flashlight to different light levels. Everything comes down to a matter of opinion. Knowing what tasks you’ll need your light for will help you decide how powerful your flashlight needs to be. As with all portable tools, battery life is a concern. If you want a rechargeable light, that has certain advantages. Having batteries that can be replaced offers others. Consider that most lights will have between 1 and 4 hours of life while in use, which will vary based on whether use is continuous or in bursts. The construction of a flashlight has the biggest impact on its usefulness. The type of plastic or metal it’s made of will add or subtract weight and durability to your tool. Remember that sometimes one thing will come at the expense of another. A more durable flashlight may be weightier than a lightweight, fragile attachment. And ultimately, make sure the tactical flashlight is easy to use–to install, to turn on and off, to activate any extra features, etc. Or it’s all for nothing. 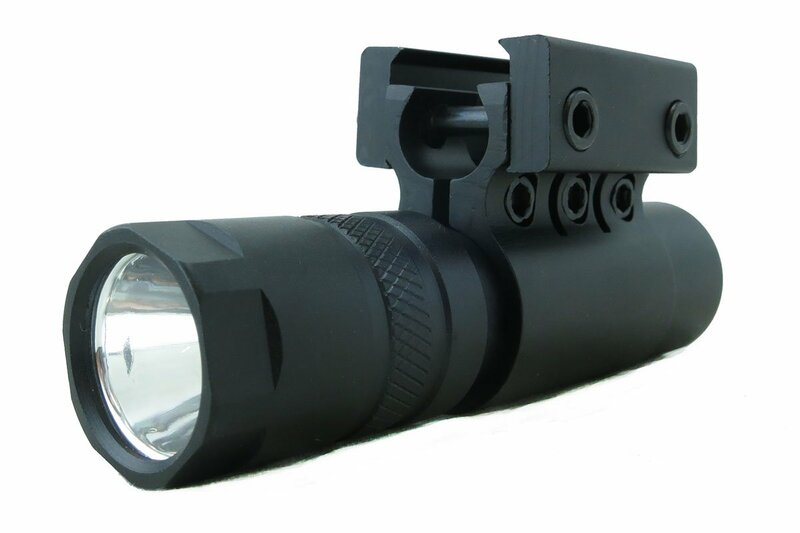 Most tactical flashlights are designed to be easily mounted on a Picatinny or Weaver rail. Installation is no more difficult than standard mounted gear. But you don’t have to be limited by rail positioning. 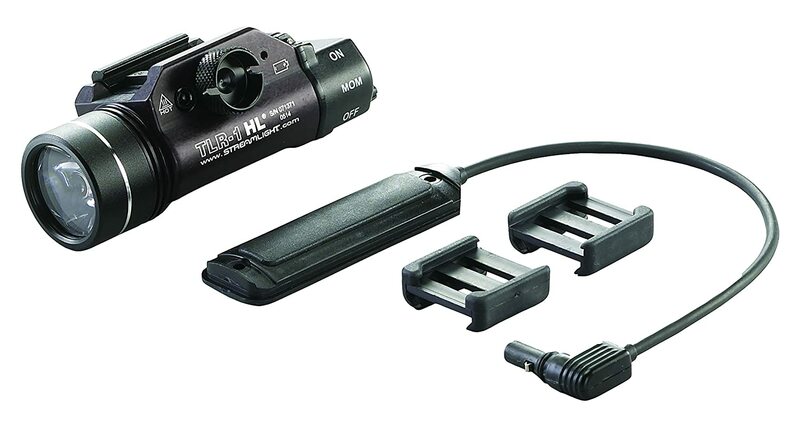 Many tactical lights can fit into separate mounting kits made available by gun retailers. Typically positioning for a mounted light is on a top-facing rail, somewhere on the handguard. But some flashlights are designed to be placed on a foregrip. Some foregrips are even designed to hold a standard ½” or 1” flashlight. Foregrip mounts will typically either accommodate an accessory with a rail, have a mounting apparatus built in or have a specific hole meant to accommodate the flashlight. The placement of your flashlight will depend on your intended use. The handguard & top-mounted flashlights are most common. Foregrip-mounted has the advantage of not obscuring line-of-sight or altering hand position. And often foregrip-mounted lights are easier to remove and use as standalone flashlights. Here we’ll look at some of the best mounted lights on the market across a wide range of features and illumination. These should give you an idea of the range of options available for a mounted flashlight, from brightness to battery life. The Streamlight TLR-1 is an 800-lumen light that delivers a wide beam great for searching wide areas like fields, alleys, yards and forests. It is lightweight at only 4.18 ounces and offers just under 2 hours of constant run time. It offers a convenient battery bay for switching out batteries on longer hunting trips. It is designed to be mounted on Picatinny rails with ease. It has several programmable features such as a user-initiated strobe as well as momentary on/off & “lockout” features to prevent running down the batteries when not in use. The TLR-1 has a durable but lightweight aluminum construction with a durable Boro glass lens that won’t break on the field. ​​​​The Orion H40-W is an excellent lightweight tactical flashlight, putting out an easy 500 lumens. This light is well-suited for indoor and close-quarters use without risking night blindness. It weighs only 3.4 oz without batteries and has a strong anodized aluminum body with a hardened watertight glass lens. It works as both a constant-on light and with a pressure-switch for momentary use. The SureFire x300 is a bright 600-lumen flashlight that offers a tighter beam to make sure you have full illumination on your potential target. 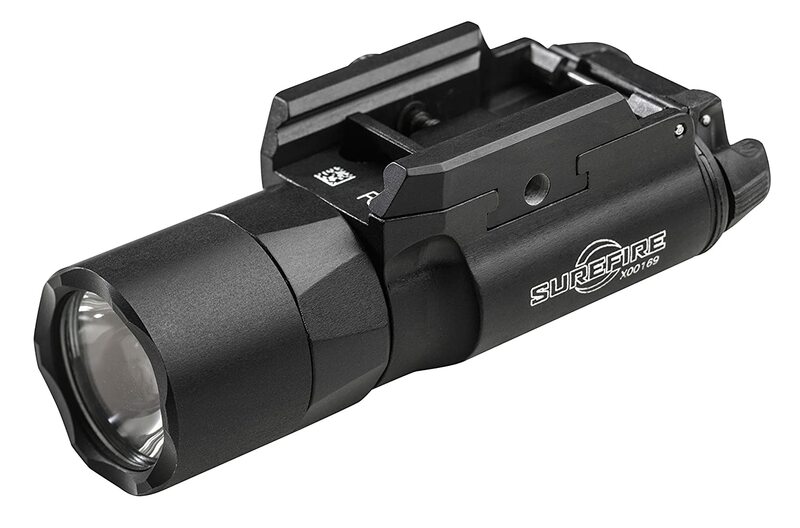 Because of its tight, bright illumination, SureFire advertises this as being excellent for disabling a target’s vision (and they’re not wrong!). At 7.2 ounces it’s a bit on the heavy side, but it makes up for its weight in punch. It has ambidextrous constant and momentary on-switches, making it easy to use. It can be mounted on any Picatinny-style rail and is made of hardened aluminum. The Monstrum tactical light is the lightest, smallest and cheapest light available on this list. It only produces 90 lumens, a significant step down from the others. But this has its advantages: Its small profile and relatively low light output make it perfect for home defense. It takes up no space on a weapon, and will not flood a room with so much light that you endanger yourself. It also has a much longer battery life than the other lights – as much as 9 hours – meaning you can rely on it to function at a moment’s notice. Yes, another Streamlight tactical light! They really make excellent products. This one is very different from the TLR-1, though. Unlike the other lights on this list, the 88040 ProTac HL will need a separate mounting apparatus since it is a standard round flashlight – that is, unless you have one of the foregrip mounts discussed earlier. 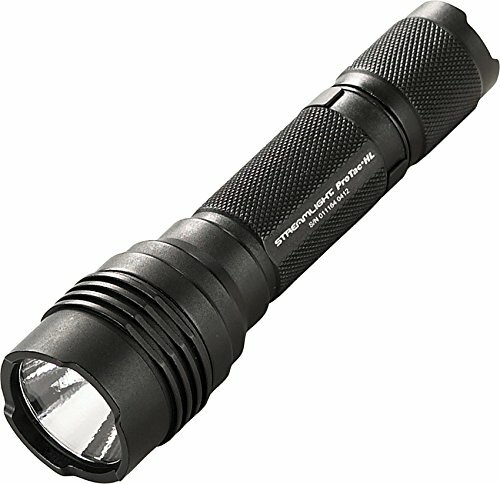 The ProTac HL puts out a whopping 750 lumens and has a lightweight aluminum construction and several bells and whistles. The ProTac has several brightness levels as well as programmable disorientation strobing features. The light boasts as much as 18 hours of runtime on the lowlight setting, which is amazing for such a small package. Just like any tool in a shooter’s arsenal, good lighting can be a tricky spot to figure out. Luckily with any of these products, you’ll be well on your way to finding out what features are most important to you. A good battery and a bright light can go a long way in the field.